Here’s a fun little project I did to put the AirPods battery level on my MacBook’s Touch Bar. Heads up: This is a not a guide for beginners! First part is a quick how to, then I’ll go into detail about how each part works. Bonus points: I had to work out how to get a lot of bluetooth information via the command line, so there’s some nice shell scripts for it too! UPDATE 1 – The script is updated to V1.2 thanks to ankushg and spetkowski. It’s more efficient and works on BeatsX Headphones too! UPDATE 2 – Here’s a link to the Spotify thing running in the pictures. UPDATE 4: You can skip creating a .sh file and paste the code straight into Better Touch Tool. I’ve updated the How To to reflect this. You’ll need a copy of Better Touch Tool for this, grab it from here. 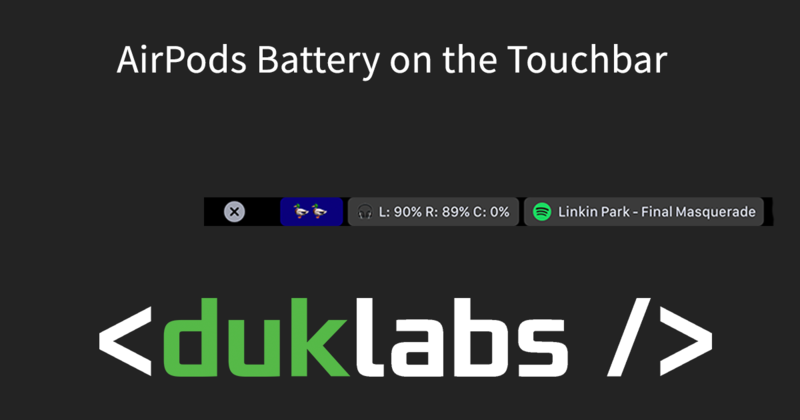 Fire up Better Touch Tool, go to the TouchBar section, click the “+ Widget” button. Click Compile/Check Syntax, then Run Script to make sure it runs okay. Hit Save and you’re good! There’s a little command line script you’ll need. Click here to download it. For the rest of this article, wherever you see /Users/duck/Scripts/AirPodsPower.sh, replace it with wherever you put the file. Open up your favourite text editor (I like Sublime Text), you’ll want to change the line at the top that says: MACADDR to be the MAC address of your AirPods. You can get this by holding option down, clicking on the Bluetooth Icon in your menu bar, then going to your AirPods (when they’re connected). Go to the TouchBar section, click the “+ Widget” button. return do shell script "/Users/duck/Scripts/AirPodsPower.sh"
While I was working this out, I worked out a bunch of extra bits that I couldn’t easily google. These pretty much *only* apply to AirPods in their current form, but can be modified to read all sorts of other bits. Using system_profiler, you can get the state of a whole bunch of stuff on the system in either XML (using the -xml switch) or indented form. I just run that command showing me all the Bluetooth Devices, grep for the MAC Address of my AirPods, grab the next 6 lines of text (this includes the line saying “Connected: Yes”, then replaces the words “Connected: Yes” with a 1 to make it neater for working with the shell script. This was built just for AirPods, so for other devices you may need to change the pcregrep bit to check for more/less lines after the MAC address is found. Secondly, getting the data for the battery levels from a device via Command Line (again, replace $MACADDR with the MAC Address of the device). defaults read /Library/Preferences/com.apple.Bluetooth will return all the info about bluetooth in json form, which seems to include every bluetooth device that has farted anywhere near the machine, so the next part will pcregrep for the MAC Address and include everything until the closing tag. Then the next line grabs just the BatteryPercentCase part. Also note it’s only really reading a cached value rather than a “live” value. So it’ll be a little bit behind (little bit being like 10-30seconds or so, good enough for what I want to do). When you’ve pasted that in, press Compile/Check Syntax, then Run Script and make sure it works (I’m not sure if WordPress will mangle the code on me). Thanks to Danoz for his help with this script! This is great! any way to do the same with Magic Mouse? By any chance there is any way to change the size of font? I’d like to see something smaller.. Thanks for the great post! I’ve used your code as a base to really make the Touchbar useful with my Airpods. Thought it could be useful! Hey dude, I don’t have time to work on this at the moment, I moved to using the menu bar widget as part of iStat Menus and it seems to be working better. If you’re keen, the source code is on Github so you could alter it to suit? This would be much nicer in the Touch Bar I think. A version that shows only the AirPod’s Battery on two lines (one per AirPod) would be a nice option too I guess!